If you happen to be on the winning side, don't forget to pick up your Super Sea Snails from Inkopolis Square. Did you participate in the latest Splatfest? Tell us below. DAMMIT!!! We were out numbered. Hmph! Edit: also, if you want to lose in Turf War, beeline it straight to the center and only be a sniper. Worst tactic yet and pretty much guarantees a loss. Everyone was doing it. It was making me nuts. Guess who forgot about this one (again)!?! @Octane If only there were some sort of Nintendo related website that could issue a reminder. Yay! I joined in this morning for Team Wizard! The voting posts are a great indication who makes more chance to win the next splatfest. My team won, but in my gameplay I think my team lost more than won. Was still a fun splatfest though. That was the most fun Splatfest ever for me, and I’ve played all of them. I won 80% of my rounds (Team Knight) and I loved this Shifty Station. Damn it, thought this was next week GGGRRRRRR!!!! @Arnold-Kage And with Nintendo watching and even controlling Pearl or Marina’s responses as one time they acknowledged certain winning streaks, when Marina was outraged by Pearl’s winning streak. Things are going to get real nasty at the very end of these Splatfests. I even read some of the responses if the other side won one time. Flaming and possibly even toxic. It will be very bad news, if the winning streaks for Marina continue, cuz Pearl will likely burst and maybe even call Marina out her identity. Picked knights and tried to play but I had forgotten how downright atrocious the online is in Splatoon 2. It's ok alone but if you wanna play with friends, it's bafflingly, laughably bad. I mean I was literally laughing as my cousin and I tried to get together on it somehow. It forces you to use that abysmal app and it is like a complex puzzle in and of itself to navigate the modes/menus. You wanna enjoy the game with friends? SHAME ON YOU! This is why Fortnite is THE online co-op game on Switch. Not because it's the best. ...but because they made it so effortless. And you know...POSSIBLE to talk to a friend. @invictus4000 not to defend the Nintendo online service, but in this case, all you had to do was go into a normal match and have your cousin join you via the friend option in-game. I did this with my gf (granted we spoke over the phone and not using the app) and it was not complicated at all. I'm glad you mentioned this because I swear it should have been that easy so it's good to hear I'm not crazy for thinking we could do it that way. However, we tried that same method, even talking over phones ourselves, but even though it showed him online, it would never let us play together. It always just said 'you cant join that friend'. 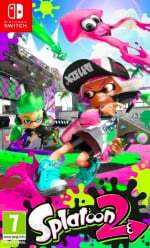 @Arnold-Kage All Im pointing is that Nintendo is watching and will use the Splatfest results to make the narrative. And when the Pearl vs Marina showdown comes, Im certain it will be worse than Callie vs Marie. Dang. It's so rare that one team doesn't nail both Normal and Pro clout. It's like... MAGIC!! 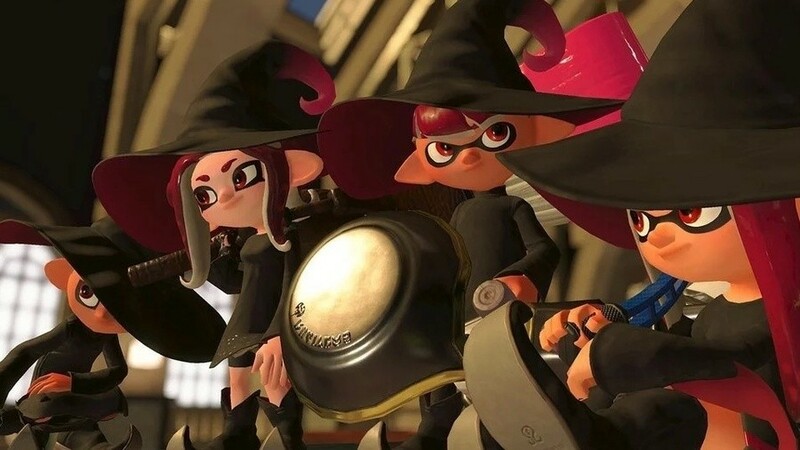 Either way this was probably one of my favourite Splatfests that wasn't Squid vs Octopus, Splatoween or Frostyfest. Real enjoyable and I wish they'd do this with the shirts more often to make them change to sets rather than staying the standard Splatfest tee. Just a shame that you needed the amiibo gear for this. I mean, I have them all, but they're still pretty rare and I know there's people who struggle to find these stupid things and can't get these pieces of gear because of it. Which would make it extra nice if this would also work with normally unlockable gear sets like the Hero and Octoling sets. If this were to become a Splatfest standard of course, which probably won't happen. I played with a friend for the first time ever in Splatoon 2, and it was quite alright. I didn`t even use the mobile app, just joined her. I was lucky she was a badass and we won pretty much every match, but still lol. I did get the impression that there were far more Wizards than Knights though. Who can blame them? Everybody knows Wizards are way cooler. 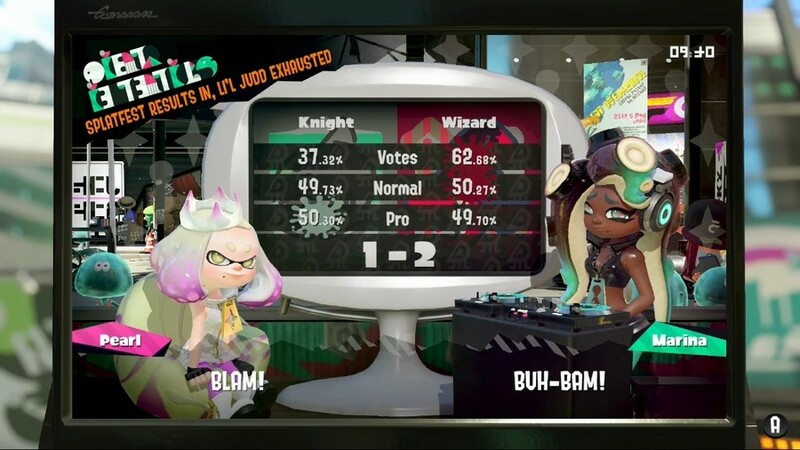 I will always remember this as the Splatfest where I (As a member of team knight) had a game with 13 kills, 2 assists, 1 death, used my armor special 5 times, inked the most turf at 1162, and my team still managed to lose the game by .4 percent. I was literally unstoppable an entire game, inking up the map wherever I went and splatting all enemies in front of me and my team somehow still didn't do enough on the side for us to win. And it was a 10x battle on top of it 😔 Still had a blast though and finished up with 9 wins versus 8 losses. I think the downside with being on the most popular team is that you rarely get to play with your color. Blood red was cool, especially with ink storm. @dleec8 LOL I see what you mean. There are times when I feel I didn't very good... And then it turns out I'm the one who inked the most turf. Or I look at the map, and see that there's a huge chunk of turf, near our base, that no one has inked yet. Always follow my heart on these. And my heart said wizards are rad. Thanks for being right for once heart. Actually got to play a bit of this Splatfest and boy am I rusty, need to get back in the swing of things. @Aerona I think Miyamoto should personally call me every time a Splatfest is about to happen. @Octane Tell him to call me too! I just wish we could keep all our splat fest T shirts. Wow, the battle percentages were close. I only played Pro; 22 wins, 20 losses for Team Knight. Won a 10x match too. You guys on Team Wizard shouldn't boast; the fact that you were overwhelmingly the popular choice yet had to squeak by to victory is a big tell. And, really? Wizards? At least knights were real. Go cosplay somewhere else, kiddos. On a more serious note, I wish we could use Ninja Squid during these. I love using the Aerospray with it and sneaking behind enemy lines. Interesting how insanely close the actual match ups were. Basically 1% difference. Splatfests are so boring nowdays. Kinda glad I left the Splatoon bandwagon. @invictus4000 Were you and your cousin on opposite teams, by any chance? That is the same message you get when you try to join a friend who is on the other splatfest team. Nintendo Online's chat app, the main reason there's Discord available. Much easier to get chatting to friends. YAY Team Wizard FTW!!!! Also, I hope Nintendo re-thinks their current plan and continue holding monthly Splatfests for many more years. Currently, Splatfests are set to end this year but I have to say, they're always so popular and it's a huge part of the Splatoon community. I don't see why Nintendo can't keep hosting them, the resources that go in to holding one are minuscule at best. If they can't be monthly, then at least bi-monthly. It's a mistake to cancel Splatfests. When they made that decision for the original, it really affected how many people played the game on Wii U, the numbers dropped significantly. I chose Team Wizard cause Marina backed it. It was my first one (got a Wii U too late to join the first Splatfests and picked up a Switch two weeks ago) and I LOVED it. I wish they would keep Splatfests going, recycle old battles or constantly do Marina vs Pearl like someone suggested above (Marina 4 life). I usually vastly prefer single player games to multiplayer, but I'm not a big fan of Splatoon single player content. I'll play for the gear and then never touch it again, spending all my time in multiplayer. However, if I could play Turf Mode with decent AI, I would, when I can't find people online or servers died. Lesson learned, Splatoon games are a first day purchase and IF they come out on a new console in the future (not that I want to see the Switch replaced any time soon), buy the console after Splatoon is announced. Well I had fun being on the knight side. I know if I was on the wizard side I would have more mirror matches which would upset me as I feel like I'm not contributing. Although I would have loved to say that I'm the wizard King #BlackClover.